Originally posted at the Digital PM Summit blog. I became a project manager after working as a SEO technician for a few months. Going from the serene, quiet environment of research and coding all day to a client-facing position with meetings and phone calls all day was quite the change! In my first few months as a project manager, I quickly learned many things the hard way. As I’ve progressed in my career, I’ve remembered those lessons and realized they are universal to project management. Here are 6 of the perils I encountered and struggle with every day. 1. Over or under communicating. When I took my first job as an assistant project manager, I was suddenly on the receivingend of an influx of client emails, many of which I didn’t know how to deal with. Foolishly, I chose to put off responding to clients I didn’t know what to do with, often until they had to call me to make sure I received their email. Now I realize how frustrating that must have been for the client, and how bad my actions must have made the company look to the client. On the other hand, I’ve seen project managers who take the communication part of their job so seriously that they write or call the client with a project status more times a day than is necessary. It can get to the point where they’ve created an unrealistic expectation of communication with the client, and have made their own work day more difficult because of this. There is a balance to communicating, and it needs to be carefully considered when working with a client. 2. Not asking for help when needed. Sometimes, the going gets tough. There are weeks I’m overloaded with deadlines and tasks that I worry I can’t finish on my own. Ask for help when you need it. Could someone (an intern, co-worker, office manager?) help you organize files for the client? Can you offload a meeting or two that isn’t necessary for you to attend? Can you ask to have your calls held for a few hours while you write out that proposal? Break down the more complex tasks into easier to manage pieces to see if you can potentially delegate or even reassign priorities. 3. Not planning for the unexpected. You know how these unforeseen challenges catch you off guard: meetings run long, client specs change, budget surprises, or deadlines change. It can take many forms. Plan for the unexpected to happen during a project or workday and you’ll have a built-in buffer if it does. Try planning an uninterrupted block of work time into your schedule every day, checking in with teammates regularly, asking questions about workload and timelines, and communicating regularly with the client to keep their expectations managed – and to make sure everyone is on the same page on deliverables. 4. Taking things personally. Your work is your work. As a project manager, you’re in communication with more people and involved in more situations than most, so it’s only natural you may encounter more stressful situations as well. Don’t take these bumps or tough conversations personally. Deal with them in a professional manner, learn where it came from, and move on. The best thing you can do in a tough work situation is to learn and handle it. Then you’ll be even more prepared to conquer problems before they occur in the future. 5. Over promising and under delivering. I love organizing tasks and helping my teammates. 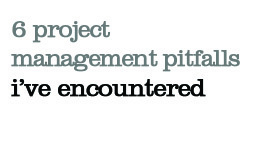 I’m also a bit type-A and imagine many project managers can relate! Due to the nature of my personality and my career, I tend to want to take on ten times more than I can handle. I learned early on that I need to carefully assess any request or urge to volunteer that comes my way to make sure I can deliver what I’m promising. There’s nothing wrong with helping out the team, but when that becomes a day of meetings keeping me from my inbox or to do list , I know it isn’t helping my clients or myself. 6. Reactive workflow. As a PM it is so easy to get caught up in reacting in the moment—missed project specs, client panic, questions from designers or developers, or simply locating files. I’ve found what I need to remember is that my job is planning and running these projects. There is a big balance between reacting, managing, and actual project planning. The quality of my work increases the more I’m able to dedicate all of my brainpower to one project-related task. These lessons are just the beginning of what I’ve learned (and keep learning) as a project manager. As I’ve moved forward in my career, there is always a great deal of change and learning to take in. But these universal problems and approaches that I’ve identified have helped me serve as a better communicator to my team and my clients. Use these perils as a starting point the next time you’re confronted with a challenging project – I’ve found it helps me greatly! What else have you encountered? Let me know in the comments – I’m sure there are lots more!